Is your vehicle insured with us? If so, we’ll automatically reserve you a spot in our VIP Program. 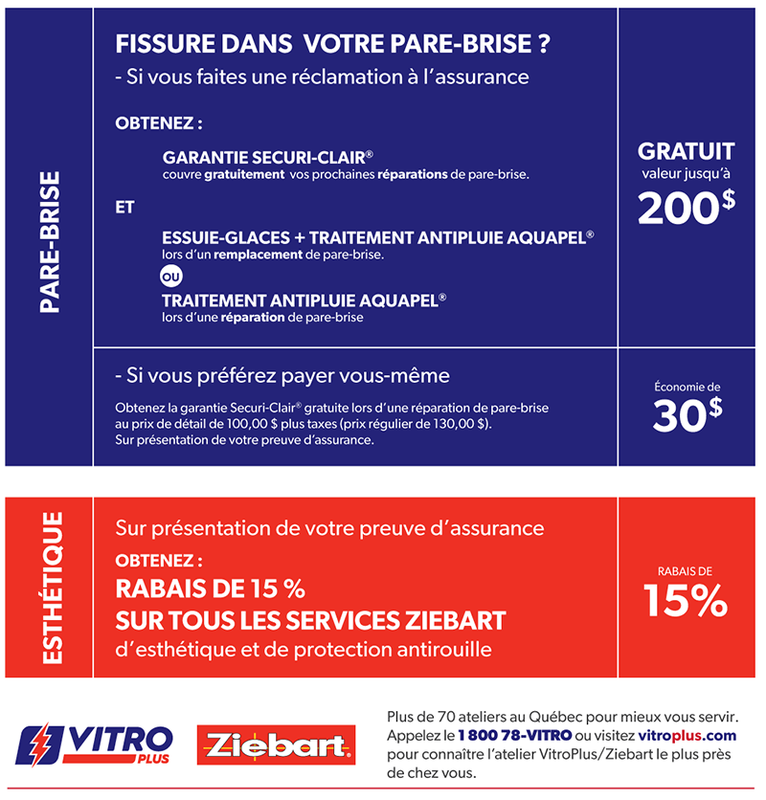 Assurances Groupe Vézina, your consultants in Damage Insurance, is proud to partner with VitroPlus/Ziebart to offer you its VIP Program specially designed for you. As one of our valued customers, you’ll benefit from these exclusive advantages and substantial savings. Our VIP Program includes the following: Click to open. Combine your HOME + AUTO insurance and save up to 25%* on your premium! A single deductible for losses involving both car and home. You pay only the highest deductible! Up to $1,000 for lock replacement, if keys to your home and/or car are stolen. Qualify for Good Record Protection. As a new customer, you could qualify for free* Good Record Protection. No increase in premium guaranteed for up to two accidents! * Certain conditions, limitations and exclusions apply. Call your insurance broker for full conditions and details of this offer. Replacement cost coverage on your furniture and other belongings with no replacement obligation. Deductible exemption (max $300) if you have not filed a claim within the last three years. If you are a member of the Réseau FADOQ, S.O.S. Identity® will cover up to $25,000 of expenses to put toward restoring your good name and credit after an identity theft. $1,500 of lost goods related to the vehicle, such as protective covers, spare parts, etc. Get help fast, when you need it! You can count on roadside assistance 24 hours a day, 7 days a week, anywhere in Canada and the United States. “Yes you can” automobile insurance. Are problems from your past preventing you from obtaining car insurance from your current broker? Has your licence been suspended? Insurance cancelled due to nonpayment? Are you wondering if you can still insure a vehicle or your home? Yes, you can! The solution is Option Transit from Assurances Groupe Vézina—an all-new program that is specially designed for people who cannot obtain insurance through a standard broker! Simply put, whatever your situation, Option Transit makes it possible to obtain car insurance. We work with clients on a case-by-case basis to determine the most beneficial option. Is your vehicle insured with us? If so, we’ll automatically reserve you a spot in our VIP Program. Assurances Groupe Vézina, your consultants in Damage Insurance, is proud to partner with VitroPlus/Ziebart to offer you its VIP Program specially designed for you. As one of our valued customers, you’ll benefit from these exclusive advantages and substantial savings. Our VIP Program includes the following: Click to open. Combine your HOME + AUTO insurance and save up to 25%* on your premium! A single deductible for losses involving both car and home. You pay only the highest deductible! “Yes you can” automobile insurance. Are problems from your past preventing you from obtaining car insurance from your current broker? Has your licence been suspended? Insurance cancelled due to nonpayment? Are you wondering if you can still insure a vehicle or your home? Yes, you can! The solution is Option Transit from Assurances Groupe Vézina—an all-new program that is specially designed for people who cannot obtain insurance through a standard broker! Simply put, whatever your situation, Option Transit makes it possible to obtain car insurance. We work with clients on a case-by-case basis to determine the most beneficial option.